Thanks for joining us in another day of our "40 Days for Vocations!" To read all the post in the series, click here. This week, I am sharing with you my personal vocation story. October 1, 2008. The Feast of St. Therese. It was a beautiful, sunny day, and also the feast day of one of our special patron saints. I just knew Andrew was going to propose that day. The way he did it took me completely by surprise, though. He got me out of work for the afternoon, and drove me about an hour away...to the Carmelite Monastery I had grown up visiting. There, in front of the statue of St. Therese, he got down on one knee and proposed to me. It was so surreal. 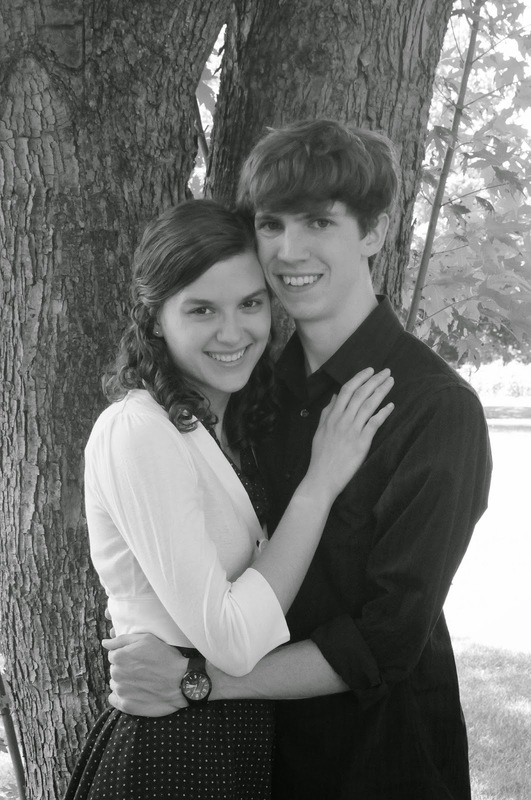 After he proposed, we went in to the chapel and prayed a rosary together, and it hit me – everything was different now. We belonged together in a special, beautiful way. We weren’t family yet, but it felt as if we were. We stopped by my sister’s college on the way home to tell her, and we told Andrew’s middle brother when we got back to Notre Dame (where he was a student, too). We called our families. It was so strange because soon...they would be one family. I can’t fully describe what made engagement so different, but I can tell you this – I am not a dating person. I am a settling down, being home with family type person. Being engaged, being on the verge of settling down as our own family felt so right. But there's still a temptation, when engaged, to make it all about the wedding. It was important for us to focus less on the wedding, and more on the future marriage. I remember the Friday afternoon that we spent looking around at different reception venues. Our budget was incredibly tight (as soon-to-be grad students) but we wanted the reception to be nice, and it was easy to get sucked into the mindset that the number of appetizers we offered our guests mattered. After looking at our potential venues, we went to Friday evening Mass at my home parish (where our wedding would be). After Mass, we stuck around to pray the rosary together, and as we sat in the back row, a number of people filed in and walked toward the altar. What followed was an incredibly simple wedding (that was probably a convalidation ceremony). It was beautiful. Afterwards, Andrew and I looked at each other, and said, "Let's go with that really simple reception hall. The reception isn't what matters...what happens here in the Church is all that really matters!" It was an important wake-up call. Engagement is such an intense period of preparation, but it really is so tempting to focus on preparing for the wrong things! We spent little time prepping for our reception, but we spent alot of time planning our wedding Mass, and even more time preparing for our marriage itself. There were marriage prep meetings, NFP classes to attend, and some deep heart-to-hearts to have. Engagement was such a time of growing closer. The things we were tackling together were big things. We were planning a wedding. We were prepping for a marriage relationship. We were looking for a place to live after we got married. We were learning about openness to children and how to space them if need be, for goodness sake! With each step, I felt closer to the man I was going to spend my life with. The seriousness of our relationship was fully affirmed. No more was Andrew introduced as my "friend" or even as my "boyfriend" - he was my fiancé. There was a definite acknowledgement that our relationship was real, and that we belonged together in a specific way. The ring Andrew chose for me was simple by lovely - exactly what I was hoping for. But what made that little glittery thing most important to me was that every time I glanced down at it, I felt incredibly loved. So, so incredibly loved. It declared to the world that I was spoken for, and it reminded me that the beginning of our marriage was not far off. 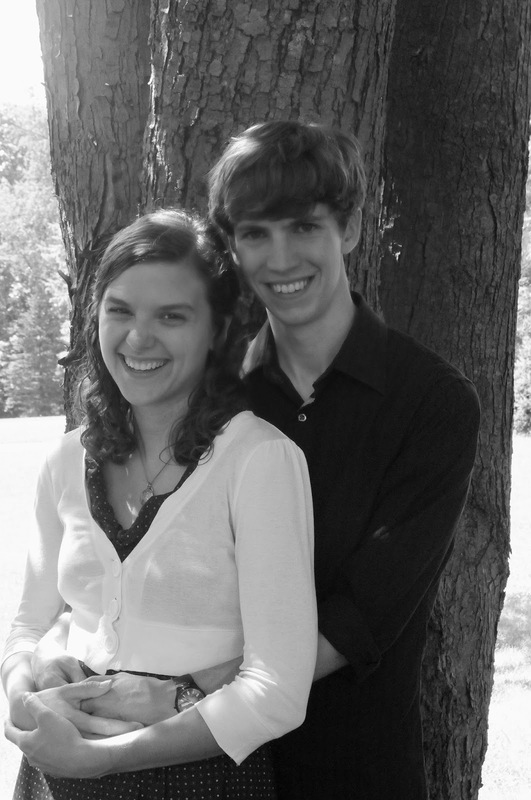 When we were dating and engaged, we were still undergrads in college, living in dorms. Despite the seriousness of our dating relationship, I had a number of friends who didn't understand why we spent so much time together. They couldn't have fathomed that we would be considering marriage so soon! Once we were engaged, though, people admitted that it was good and right that we spend most of our time together - we were preparing to start a family! Okay, it was hard to wait for our wedding day. It was really hard. In our hearts, we felt as close as if we were already family - but we weren't. And we were still being chaste, with all the challenges that brings. So, waiting to begin our marriage was hard. But, at the same time, there was tremendous peace. After the intense discerning we had done, there was such peace in knowing that we were doing our part to follow God's Will for our lives. And there was such peace in knowing that we would soon belong to each other in such a special way. But all of that aside, we were ready for our wedding!!! I also remember being really frustrated with so much of the wedding planning focus being on the reception and what I wanted to focus on was the wedding liturgy and getting our marriage off to a good start. This series is great! I am really enjoying it. We also spent a lot of time on planning the Mass and found a reception hall that planned the entire reception for us...does it really matter what type of flower is in the centerpiece and who baked the cake?? Some people complained that we were having a full mass with many hymns to bout. I held fast to what we wanted and said I was only getting married once so I was taking as much time as I wanted for the Mass. Looking forward to the rest of your series!